We are proud to announce that Woodstock is home to a number of projects which allow residents to engage in the process of local renovation and renewal. Our mission is to improve the area sustainably, from the roots up. One of the projects that we are achieving this vision through is the pilot project collaboration with Streetscapes, where homeless people are given the opportunity to tend gardens and sell the produce for profit. This project served as a catalyst for other developmental projects in the area which have the potential to change the social and physical landscape of Woodstock. The most recent of these innovations is the transformation of Hanwell Lane into an urban garden which will benefit the community. The project aims to create an urban food garden in Hanwell Lane, Woodstock. The garden will give people the techniques and space to grow fresh produce for feeding programmes. It will also be an area where community members can support one another through interaction and skill sharing. The main aim is to create a productive environment to empower the community. The hope is that this model will be applied in other suburbs throughout Cape Town. The project was born out of the vision of Mr Graeme Allen. He lives next to Hanwell Lane and was frustrated by the level of vandalism and illegal dumping of waste in the street. He refused to believe this was the only option, and obtained a lease for Hanwell Lane to establish a community garden. Mr Allen then spent six months communicating with other residents and the City Roads and Planning department to create a plan. This blueprint was then shared with homeowners in Roodebloem Road, Roberts Road, Beacontree Lane and Hillyard Street where local support was harvested. Eventually an agreement was signed by many local residents to turn Hanwell Lane into a community garden. This project is an example of what can be achieved in a community through collaboration. Mr. Allen has garnered support from invested partnership who are willing to see the project through to the end. Connective Collective (CC) – a collection of people who provide platforms for sustainable community engagement. Their goal is to facilitate citizens in building communities that live in harmony with the earth. 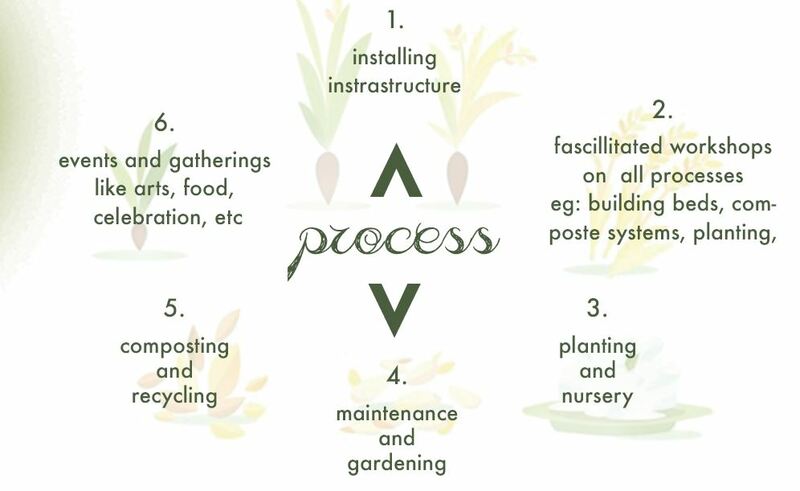 Guerilla House – an urban permaculture training platform that educates and equips citizens using affordable regenerative technologies. They specialise in creating and running organic food gardens, water harvesting, soil building, animal systems, mushroom cultivation, grey water systems, alternative building technologies and waste regeneration. Community – people living between Hilyard and Salisbury Streets, Roodebloem and Roberts Roads, and those that use Hanwell Lane for thoroughfare. They are encouraged to take ownership of the lane and invest where possible so that they can benefit from it flourishing. Contributors – property owners neighbouring Hanwell Lane have contributed to the cost of gates and the further development of the project. Woodstock Improvement District (WID) – we aim to utilise the community garden project to extend our social outreach programme. Woodstock Residents Association​ (WRA) – facilitates engagement between local authorities and residents living in Woodstock. They provide a platform to share information, discuss differences and solve problems in the community. What is the vision for this community project? The ideal outcome is a community garden that benefits all who live and work in the neighbourhood. The lane will serve as a meeting space where people can interact, educational workshops can be held and resiliency skills can be obtained by anyone who would like to learn. The partners are aware of the challenges this public space may encounter, and there are discussions underway on how best to approach potential problems. If you would like to view the vision for this project please contact ConnectiveCollective through one of the Public Participation Process (PPP) channels (see below) and we will forward you the full proposal. Feedback, both for and against, is welcomed as we would like to understand and communicate the community’s views. The email address hanwellgarden@gmail.com (which will also be displayed in the lane). A post box in the lane for residents to hand write and deliver your views. A telephone number, which residents can contact, and a WhatsApp group/ SMS group which residents can join to receive information about the project. A Facebook page where residents can post their views and find more information about the project.